BOISE, IDAHO -- Strategies used to bring back from the brink of extinction a population of central Idaho sockeye salmon have been so successful they could be used as a blueprint to prevent other extinctions, fisheries biologists say. Thomas Flagg of the National Oceanic and Atmospheric Administration and Paul Kline of the Idaho Department of Fish and Game published their findings earlier this month in the journal Fisheries. Scientists said a key strategy has been maintaining genetic diversity that has resulted in a greater number of sockeye with better survival skills, resulting in more fish returning to Redfish Lake. "The survival advantages and apparent rapid increased fitness demonstrated by Sockeye Salmon hatched in Redfish Lake have allowed the development of realistic population triggers for the program's expansion effort," the report said. "This type of natural rebuilding scenario is the hoped for result when conservationists intervene to rescue depleted populations." Depleted in this case has a very precise number -- 16. That's how many wild adults -- 11 males and five females -- returned to the Sawtooth Valley from 1991 to 1998 and, through hatchery programs, ultimately produced more than 10,000 adult descendants. The results showed this fall as some 1,400 endangered sockeye made the 900-mile journey from the Pacific Ocean to the lake in the Stanley Basin. That's more than in any previous year going back nearly six decades. The report estimates that at one time some 30,000 salmon made the trip to the 6,800-foot elevation Redfish Lake and several other lakes in the valley. The numbers started declining, the study said, with intensification of commercial fisheries in the lower Columbia River. A dam on the Salmon River built in the early 1900s blocked salmon for several decades from reaching Redfish Lake, itself named after the red-colored sockeye that once arrived there in abundance. Additional dams on the Snake and Columbia rivers added to the fish's challenges in succeeding years. The run was listed as endangered under the Endangered Species Act in 1991. That kicked off a hatchery program that scientists in the report said was able to retain about 95 percent of the genetic variability remaining in the population. Besides genetic diversity, biologist also devised systems to raise the salmon in captivity. "Although easily overlooked, a major program accomplishment was simply the development of fish culture protocols for rearing Sockeye Salmon full term to maturation," the report said. Captive sockeye have been reared at two locations. One is the Eagle Fish Hatchery in southwest Idaho run by the Idaho Department of Fish and Game. Fish have also been raised at the National Marine Fisheries Service facilities at the Manchester Research Station in Port Orchard, Washington. 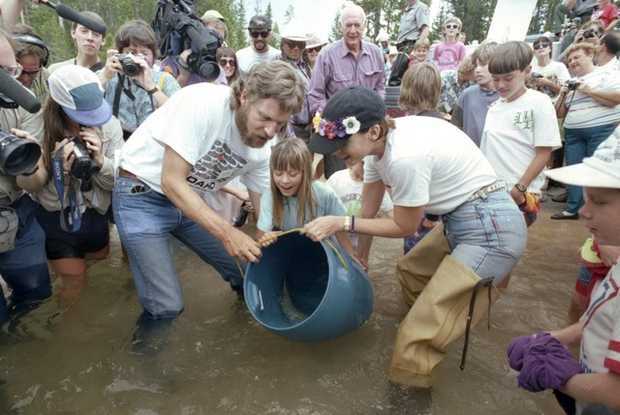 While the program has relied on fish that never made the perilous trip to the ocean and back, it also produced an estimated 3.8 million eggs and fish for reintroduction to Sawtooth Valley lakes. Besides releasing young fish to head for the ocean, called smolts, releases also included adults let go annually to spawn naturally in Redfish Lake. The report concluded that Redfish Lake could eventually produce enough naturally raised young fish to head to the ocean that enough would survive and return as adults to exceed "self-sustainability." Ultimately the recovery plan is to have 1,000 or more fish spawning in Redfish Lake for multiple generations, and at least 500 spawning in one of four other lakes in the basin. 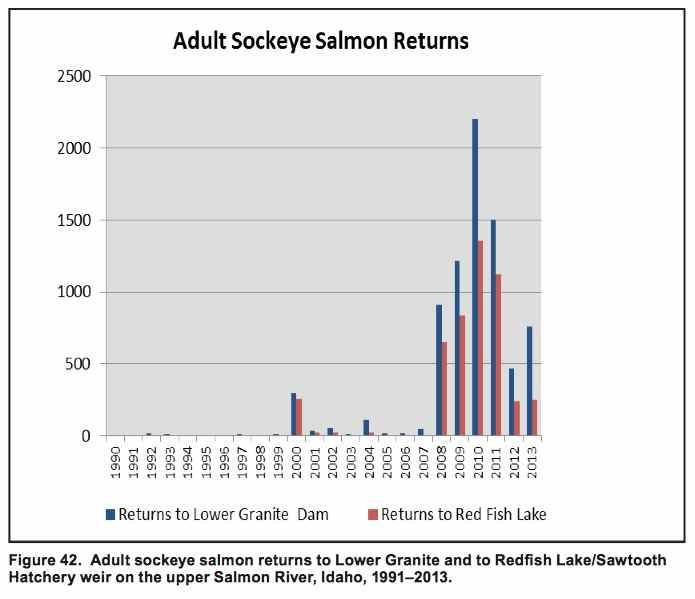 The report said that when enough adult salmon start returning to Redfish Lake, efforts could begin to bring sockeye salmon back to nearby Pettit and Alturas lakes.